To open a new company in Hong Kong, you need to register it with the Companies Registry and the required permits for operations. Once the company becomes a legal entity, you have to register it with the Hong Kong Tax Authorities. 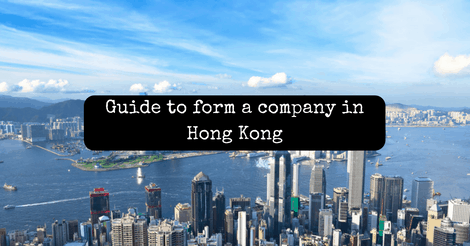 This is a complete guide to assist you to form a company in Hong Kong. The first and most important step is deciding the type of company to form in Hong Kong. You can decide this depending on future expectations, nature of operations, and capital availability. Besides, you will also need to get the right business name by performing a complete search at the Hong Kong Companies Registry. In Hong Kong, there is no minimum share capital requirement for incorporation. It is because of this that many investors prefer to run private limited liability companies in Hong Kong. Starting a limited liability company is entirely based on your Articles of Association and Memorandum of Association. The main requirement is that the company must have a shareholder (at least one), a director, and secretary who resides in Hong Kong. Besides, this number cannot go beyond 50 and shares are not transferable. In some areas of operations, your company might require more than a single permit to operate. Some of these sectors that require additional licenses include restaurants, money related operations, import & exports, and telecommunications. If the company is dealing with residential care homes, an environmental permit will also be required. To operate in Hong Kong, there is no VAT required. An application duly signed by all the authorized people. Details of principal shareholders, copies of their identity cards, residential proof, business proof, and signature specimens list. In some instances like when the company is very big, the bank may require additional documentation. The certification of the outlined documents can be done by the company’s attorney, a banker, CPA, or secretary. To recruit staff for your company, there are several methods you can utilize. You can opt to post an advertisement in the local newspapers or use trade fairs. However, the best method of doing it is through professional recruiting agencies. Though these agencies will charge a fee, they are faster, thorough, and have better chances of getting you the best staff. Even though Hong Kong is a Special Administrative Region of China, its political and economic stability has not been affected. It is considered the gateway to entering and reaching billions of customers in China. We are the only company opening bank accounts in Hong Kong for 99% of the clients, our strength rely on a rigorous process requiring many hours of compliance work (average of 13 hours of work to prepare the documented client profile for the bank).